Here's my card for this month's Verve Diva Inspiration Challenge. The challenge theme was "pink," and I think I have that covered here, starting with the yummy cupcake image. The cupcake is from Verve's Small Packages stamp set. I colored the image with Copic markers and cut it out, then used foam tape to adhere it to a pink textured cardstock circle. The circle was adhered to a cream panel. I added a darker rose circle and a sparkly silver fishtail flag strip to complete the cluster of elements at the bottom of the card. 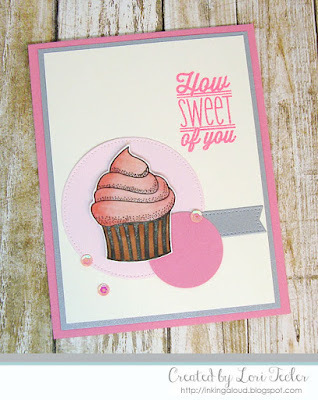 The "how sweet of you" sentiment was stamped at the top of the panel in watermark ink, then heat embossed in bright pink embossing powder. I matted the panel on silver paper, then adhered it to a rose card base. A trio of pink sequins arranged around the cupcake and circles completed the design. This is just scrumptious, Lori! Love the circles. Thanks for playing!